This stretch is full to the brim with all manner of exciting features – both man-made and natural. A swaying suspension bridge (Biblins); soaring cliffs (the Seven Sisters on the northern bank- modestly cloaked in trees for the most part, and the massive naked slabs of Coldwell rocks – further upstream on the southern side of the river); rapids; the iconic views from Symonds Yat rock; a rope ferry across the river at the base of the Yat; the castle at Goodrich; and finally the view of Ross and its church spire, which seems to epitomise the rural idyll. This stretch is the one in which the Wye makes the unexpected transition from the placid middle age which characterises it upstream in Herefordshire, to the turbulent rebel which flows from Ross to Chepstow. Wye Valley and Forest of Dean Tourism Association publish a downloadable brochure with 12 circular walks, some of which explore this stretch of the Wye (www.wyedeantourism.co.uk/g_walks.html). The Forest of Dean Tourist Information service (www.royalforestofdean.info/walking.shtml) describes walks on this stretch of the Wye. 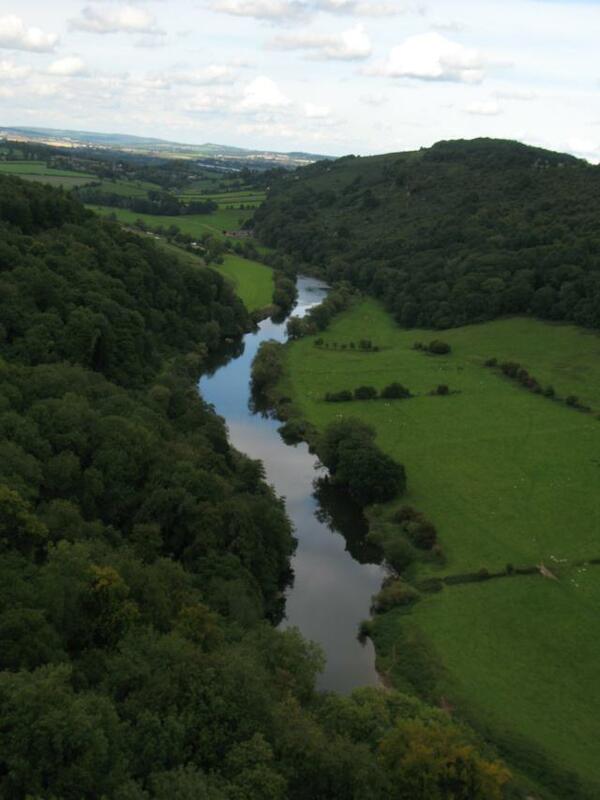 The long distance Wye Valley Walk provides some information about walking along the Monmouth to Ross stretch.